l'Erede di Satana Seddok (1960) - Sci-fi-central.com. Italy  1960  107m   Directed by: Anton Giulio Majano.  Starring: Alberto Lupo, Susanne Loret, Sergio Fantoni, Franca Parisi, Andrea Scotti, Rina Franchetti, Roberto Bertea, Ivo Garrani, Gianni Loti, Tullio Altamura, Gianna Piaz, Francesco Sormano, Nicoletta Varè.  Music by: Armando Trovajoli. I've been attempting to watch all 50 films in my 50 Classic Horror Films collection (a box set putting my total horror collection in a very high range). 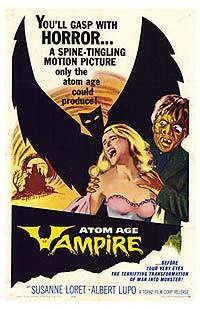 But I'm already stuck on number 2, "Atom Age Vampire" because of what I have heard about horrible editing and a slew of scenes that were chopped to please Americans censors (the film is complete in Italy). But if I want to get going through these, I must watch them all, so here I go again on my own... see you in 2 hours. Okay, the film is not as bad as some make it out to be. Yes, the editing is a little sloppy. And yes, some parts are chopped out (though I would never know if I hadn't read about it). But the acting and plot and everything else are just fine. It's a story of a stripper who gets disfigured in a car accident (not unlike the car accident in "Carnival of Souls") and is taken in by a scientist who has invented "Derma 28" which can cure all skin blemishes and maybe even cancer. As you can expect fro ma horror film, something goes wrong and hilarity ensues. There is one big twist in the middle I never saw coming and I loved it. This film is worth watching if you're a horror buff, but otherwise has little to offer. It works great as a smoking game, not unlike "In the Mouth of Madness" due to the 20 times that a character talks about their need to smoke. Strangely, i none scene a man asks to go outside to smoke when he's sitting next to a man inside smoking. But maybe that's the polite thing to do. Oh, and there's not a single vampire in this movie. Review by gavin6942 from the Internet Movie Database.